The Cassie he's speaking of is the daughter of Scott Lang (Paul Rudd), and seen in both Ant-Man and the sequel Ant-Man and the Wasp played by Abby Ryder Fortson. Cassie, full name Cassandra Lang, eventually becomes known as Stature and uses Pym Particles in a similar manner as her father. She's the first member of the Young Avengers to be seen on screen, however some may recall that Elijah Bradley aka Patriot was in early drafts of the Black Panther script. 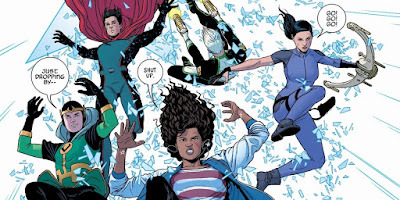 The members of the Young Avengers could easily help make up for the expected losses of Captain America, Iron Man, and Thor. It could be a way for Marvel to give this next phase a burst of creative energy with characters like Kate Bishop aka Hawkeye, Patriot, and Hulkling. Of particular interest could be the introduction of Wiccan and Speed, the children of Scarlet Witch and Vision. I think it's entirely possible Avengers 4 ends by teasing the Young Avengers in some way.